Need a delicious vegan crowd-pleaser without the fuss? Sound too good to be true? It isn't. Here I can provide you with the solution, tried and tested might I add, on an unsuspecting group of non-vegans during a work placement in Malta. It's a one pot, one frying pan job with easy to source ingredients, and cooking couscous en masse is simple. It was also a life saver for me, a decent meal during a month of somewhat bland, uninspirational fare. I'm even posting it here now as requested by one of my guinea pigs, Hassy! Proof it went down okay then, I don't think they even missed the meat. Chop the onion in half and then slice thinly into half rings. Finely chop the garlic and then fry both in a deep pan in enough olive oil to coat the pan base. When the onion and garlic are beginning to brown, add the ground coriander, cumin, paprika, cinnamon, turmeric and cayenne and fry for a further 10 minutes on a low heat. It is important to let the spices fry long enough for them to release their flavour and give the dish a proper aroma. Add the chickpeas in their tinned liquid, the chopped tomatoes and the vegetable stock and let simmer. Cut the aubergine into cubes and fry them in olive oil until they are soft and brown. They will soak up a lot of oil but this gives them a tender, melt in the mouth consistency so don't be stingy with it. Add the fried aubergine to the spiced mixture and leave to simmer for 20 minutes. Halve the button mushrooms and pop these in the frying pan until browned. Roughly chop the dried apricots and then add both these and the mushrooms to the pot. Leave to simmer for a further 10 minutes. Pop some flaked almonds on a shallow tray under the grill. Keep a close eye on them, you only want them a little toasted, mine usually end up burnt the first time round! Now, when it comes to cooking couscous, for years I followed the instructions on the packet and cooked it in a given quantity of boiling water, in a pan on the hob. This often resulted in a rather sticky mess. Since then, I have become learned in what I consider to be the simplest, optimum couscous cooking method. Wait for it..... it's complicated...... Pour the desired quantity of couscous into a mixing bowl and then pour boiling water over it until it is covered with just a couple of mm on top. Yes, that difficult. Put a plate over the mixing bowl and leave for five minutes. This steams the couscous nicely, you can taste it to see if it's cooked, if it is still a little hard, just add a bit more water and leave again to steam. Separate the grains with a fork and add a little vegan spread or olive oil to taste if desired. Voila. Perfect couscous, and, like I said, good en masse. 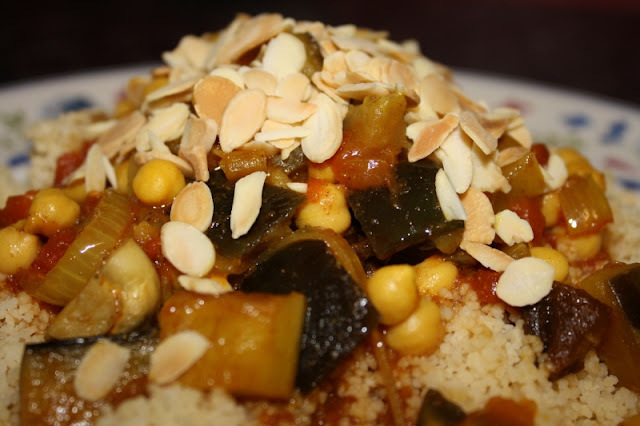 Mound the couscous onto plates and pour the tagine on top with enough of the spicy liquid for the couscous to soak up. Sprinkle with flaked almonds and some chopped coriander and you're done. Having now actually been to Morocco, I can tell you that this tagine is far tastier than any vegetarian tagine or couscous I had there. The food is actually surprisingly bland, not spicy like this at all. I love spicy. I do however now have myself a very authentic clay tagine and when I get around to soaking it and baking it and oiling it, I will be making this in it. Exciting.